One way to drastically improve the lives of the rural poor is by improving their farming productivity. In many developing countries, they cannot afford irrigation systems meaning farming must take place during the rainy season. This not only limits their growing season but also restricts the types of crops they can grow. Only the hardiest of plants are able survive the erratic nature of rain during the rainy season. There is however, a trend towards making irrigation systems more affordable. 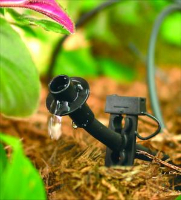 Driptech for example has gotten a lot of attention for its low cost gravity-fed drip irrigation system. Kickstart is tackling the problem with its man-powered pumps. Yet both of these systems rely on a source of clean water which can sometimes be out of reach. So we've often wondered whether RainSaucers can help. The main limitation on RainSaucers, in the irrigation context, is volume of water. Our 200 liter barrel only represents enough water for a small plot for a month at most. But if emptied throughout the rainy season the output of a RainSaucers system can be over 2,000 liters, enough to keep a small plot thriving throughout the rainy season and beyond. The RainSaucers system (empty) is small and light enough to be setup right next to the plot. And since it is already elevated off the ground it would plug nicely into any existing gravity fed drip system. So the net effect of a RainSaucers system combined with drip is that rural farmers can have all the benefits of irrigation without much of the physical task of getting water to the plot either by pump or fetching.